Central Asia consists of 5 stans mainly. These 5 countries are Kazakhstan, Uzbekistan, Kyrgyzstan, Turkmenistan and Tajikistan. These are land locked countries. Central Asia a beautiful land of mountains, rivers, lakes and deserts. At the same time modern cities like Almaty, Tashkent, Astana, Bishkek and Samarkand are a tourist place with absolute modern infrastructure and amenities. In recent times tourists flow in Central Asian countries have increased substantially. 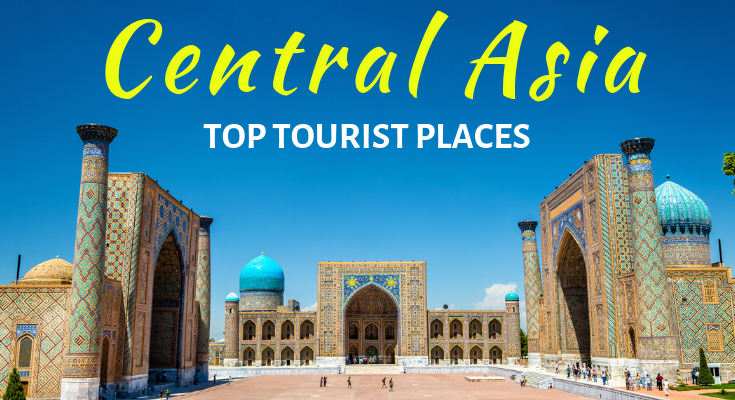 There are many wonderful Tourist Places in Central Asia which you can visit on your trip to these countries and cities. For you we are bringing Top 22 Tourist Places to Visit in Central Asia. Issyk-Kul Lake in the north-eastern Tian Shan is the largest lake in Kyrgyzstan and the second largest mountain lake in the world after Titicaca. Issyk Kul is one of the prime tourist spots in Kyrgyzstan. This lake never freezes. This is a beautiful lake and you must be here to have a wonderful experience of seeing the water of the lake and experience simply sitting on the shore of it. Issyk Kul Lake is quite close to the capital city Bishkek and this is also a reason why it simply gets in the itineraries of visitors. 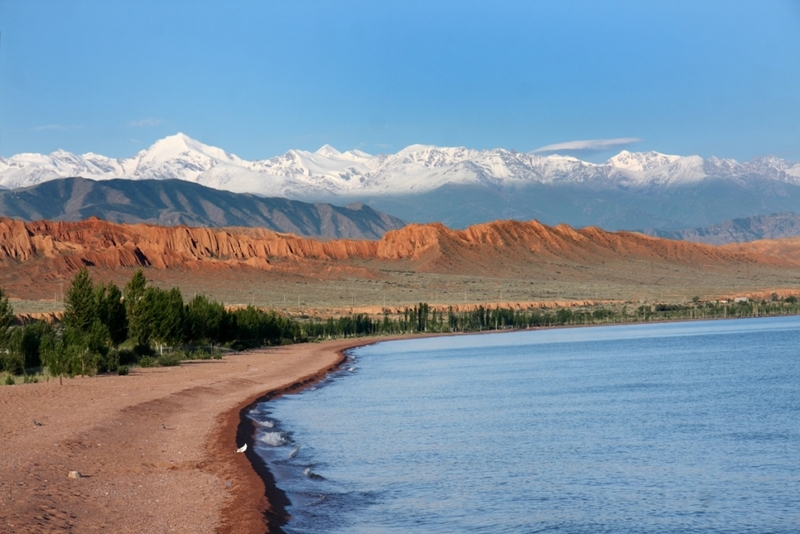 A beach holiday is quite popular at Issyk Kul Lake. For the visitors there are resorts, boarding houses and vacation homes. Cholpon Ata on the northern side of Issyk Kuk Lake is the best known town to the lake. You can enjoy a good time in the town. Issyk Kul Lake is surrounded by such beauty that once you see the entire panoramic view you surely will never forget it. 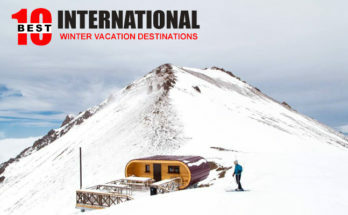 Chimgan Mountain ski resort is a wonderful place to be at especially in the summers when it is hot in Tashkent, Uzbekistan. 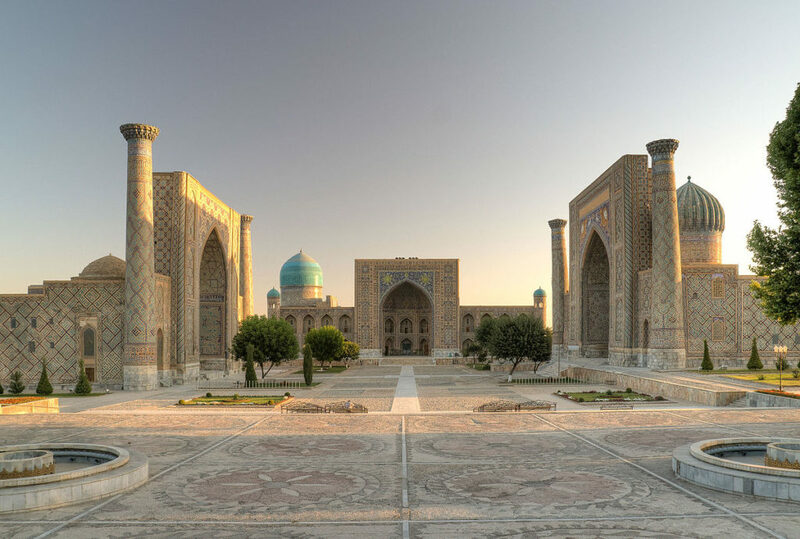 You should be here when you are on a Tashkent trip with an Uzbekistan Tour Package or a Tashkent Tour Package. You can reach Chimgan in 2 hours ride from Tashkent. This is also one of the best places to be during winters. 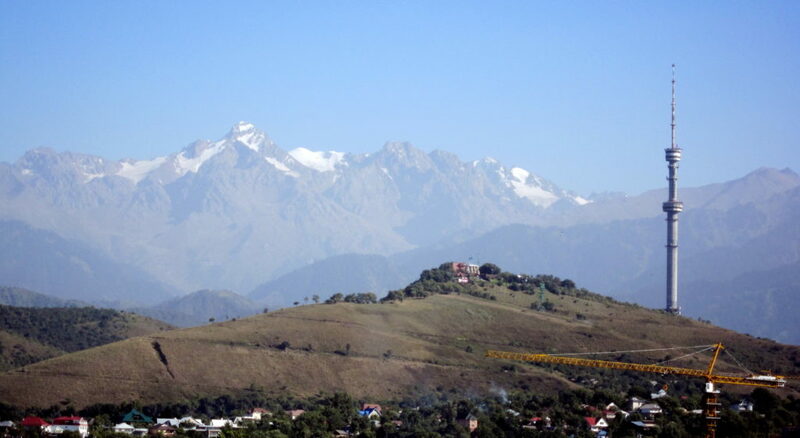 Chimgan is at the height of 1600 meters in the western Tien Shan Mountain surrounding Tashkent from the east. There is a snow blanket covering Tien Shan Mountain at the top and snow slips down to the downside of mountain in winters which makes entire space a heavenly one. Chimgan is also popularly known as ‘Uzbek Switzerland’. Slopes here are covered with relict-fir tree woods and Mountain River sails through mountain and hills. 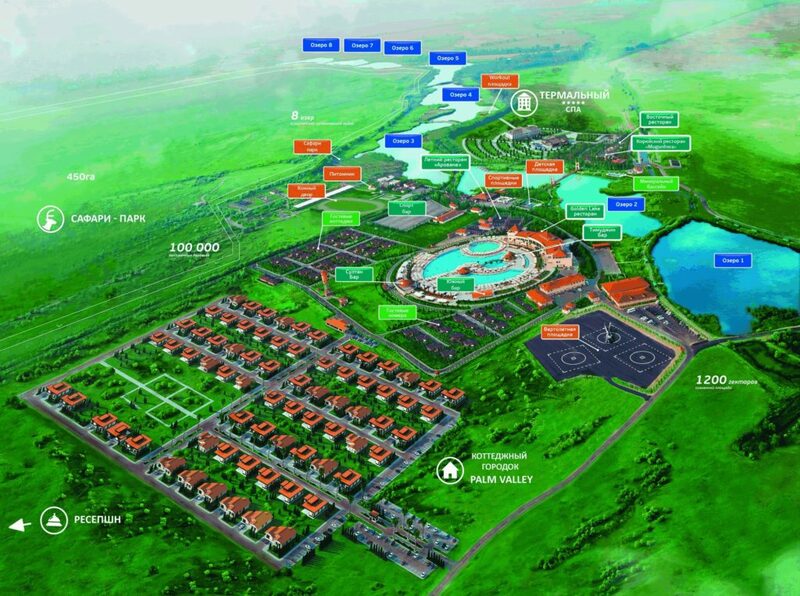 Chimgan has been developed as a recreational zone and tourist place. You get the best of amenities here as there are many rise buildings, hotels, cottages, cable rail roads, shops, bars, restaurants and cafes. You also have recreation zones, sana tourism and summer camps here. Registan Square is located in Samarkand, Uzbekistan. Registan represents Timurid period in Uzbekistan. In those days it was the heart of ancient Samarkand of Timurid dynasty. Meaning of word Registan in Persian language is a desert or sandy place. Registan square happened when craftsmen and builders from across the empire of Timurid period came along in the late 14th century and build this beautiful Registan Square. Samarkand city is said to be a place where people from different lands came and lived. It had wonderful Islamic Architectures and it was a great learning center. All of this you can feel together in Registan Square which represents all three aspects of Samarkand. Big Almaty Lake as the name suggests is in Almaty, Kazakhstan or 25 KM drive from Almaty to be precise. 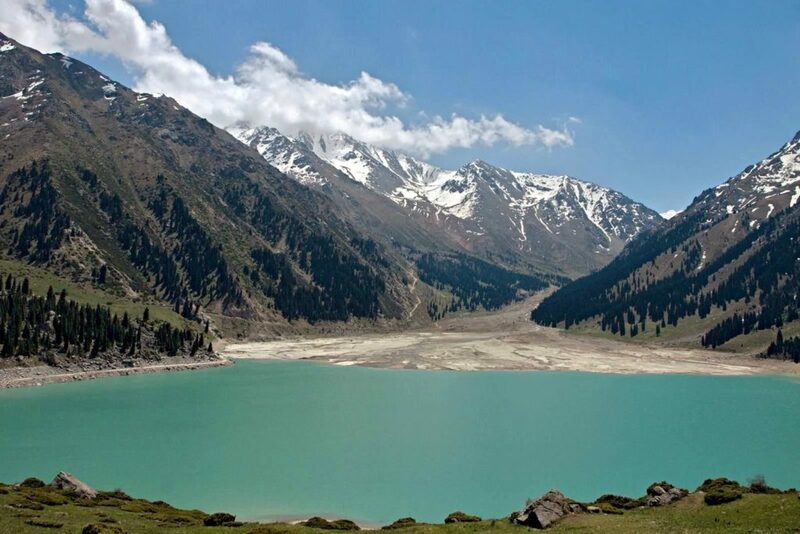 This is located at an altitude of 2511 m, Lake is 1.6 km long, little under 1 km wide, and up to 40 m deep and located at the altitude of 2511 m. Big Almaty Lake is surrounded by three majestic mountain peaks, Soviet (4317m), Ozerniy (4110m) and Turist(3954m). Unique thing about the lake is that it changes its colour in different times of the day, month and year. Water of the lake reflects the magnum opus of nature that surrounds the lake on its surface. Big Almaty Lake is considered to be one of the most beautiful lakes in the world. This is definitely the second most popular lake in entire Central Asia after Issyk Kul Lake in Kyrgyzstan. The lake is surrounded by mountains and giant Tien Shan firs and among these you would find Big Almaty Lake a scenic beauty. You can visit the lake during May-June which is considered the best time to visit the lake for tourists. Charvak Reservoir or lake is a water reservoir. This is located in Bostanliq district in northern part of Tashkent, Uzbekistan. 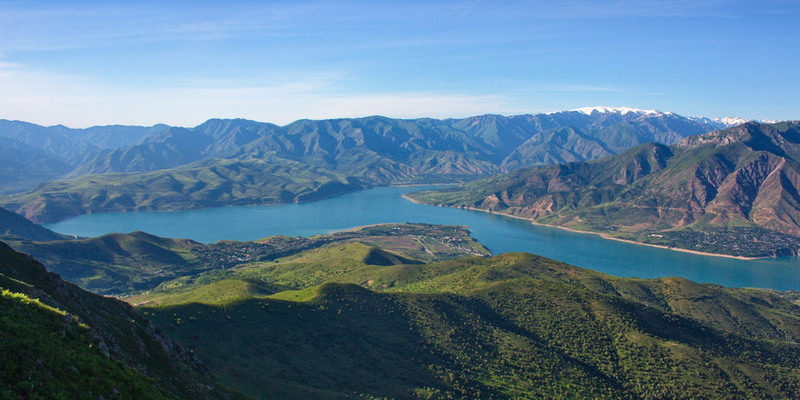 Today Charvak Reservoir is one of the best recreational areas in Tashkent for those coming here on Tashket Tour. It is quite easy to get there because it is located only 60 KM away from Tashkent. The coastline of the reservoir goes up to 100 KM and the reservoir is surrounded by green slopes of mountains, and snows topped. Charvak Reservoir was built in 1970. There are lot of recreational zones, boarding houses and summer camps within this area. Lake Charvak Resort here attracts huge number of visitors and tourists from and outside Uzbekistan. You can indulge in some interesting activities here like swimming, hiking along nearby hills and mountains. Adventure lovers can also go for paragliding or ride on water. Others can simply enjoy the peaceful environment, views of pure blue colored water and fresh air. Not just the reservoir but surroundings sites are also quite beautiful to watch. If possible don’t forget to witness sunrise and sunsets here which are unforgettable once they set into your eyes. Medeu is a world Known ice skating rink. It is located at the altitude of 1,691.2 meters above sea level in a mountain valley on the south-eastern outskirts of Almaty. As of now the rink is artificially converted rink. In this ice surfaced rink many sports contests are conducted which include skating, hockey and figure skating. High mountain skating has gained lot of popularity in the world in last few years and this makes Medeu quite a popular place. Medeu has witnessed many world records in all the speed skating distances. Medeu continues to be one of the best-known tourist locations in Kazakhstan. Shymbulak or Chimbulak is a ski resort in the beautiful mountains near Almaty in Kazakhstan. You have to be at Chimbulak Ski Resort when you are in Almaty. The skiing journey up the road is quite amazing as one see snowy slopes and Tien Shan firs all over your left, right and ahead. And on the slopes is Chimbulak Ski resort welcoming the visitors. Chimbulak area offers you the snowy alps, gardens, forests, Tien Shan spruces and crystal clear water of the mountain Malaya Almatinka river to admire. Kok Tobe is the highest point in Almaty. So visitors go up there and experience amazing view from the top. It is truly a hilarious experience. 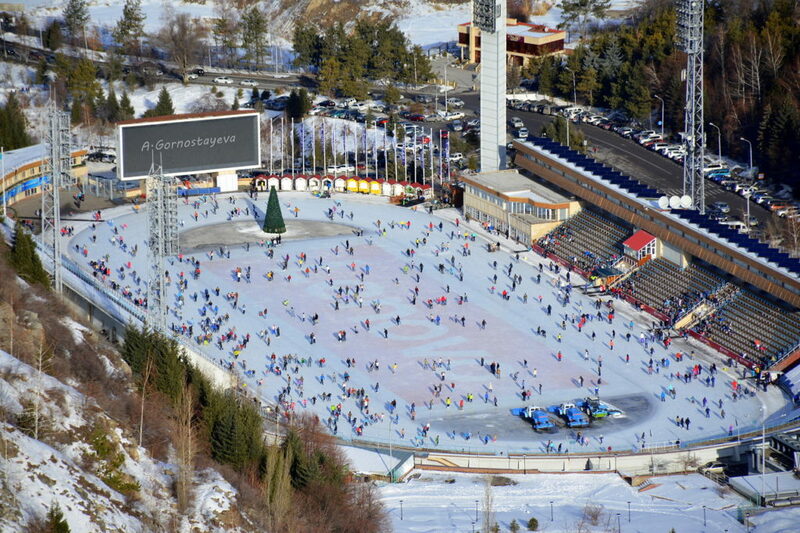 On a Almaty trip with Almaty Package, Kok Tobe is one of the main landmark points of Almaty. On top of Kok Tobe there is recreational area with many amusement parks type attractions and on the foot of is another attraction, TV tower. Food lovers can enjoy cuisine of lot of restaurants located here offering variety of food. The TV tower is one of the highest towers in the world and is unique in a way that the entire tower is built of steel. 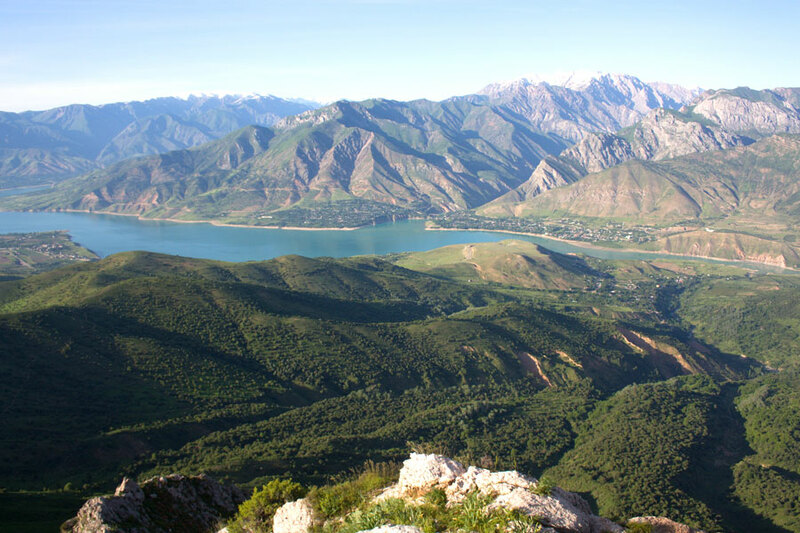 One can have panoramic view from the top of the Kok Tobe Mountain and see Almaty in all directions. One can get to Kok Tobe top through cable car and this little journey is also quite interesting. You go through some of the oldest part of Almaty city. Evening is the best time for those who would love to see city bathing in lights. 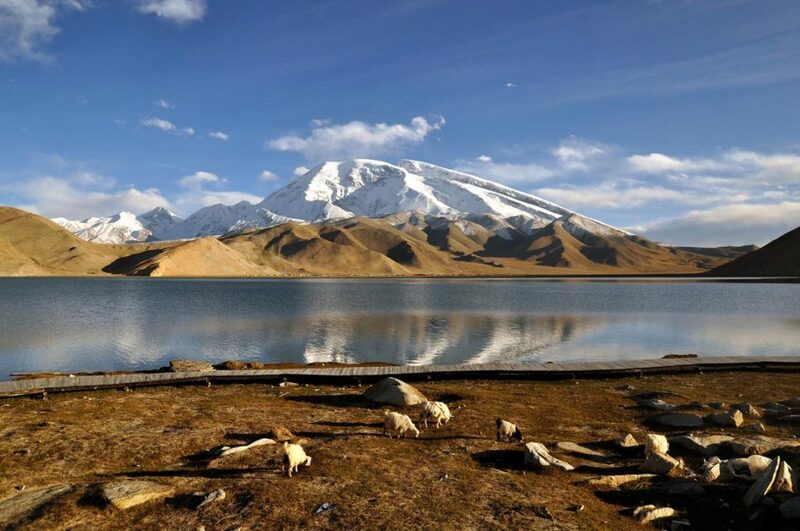 Karakul Lake is located at the height of 3914 m adorning the highest part of Pamir Highways. This is in a village with the same name Karakul. Karakul means Black so Karakul Lake is translated as Black Lake. Pamir Highway is just few hundreds meters away from the Karakul Lake and you can enjoy the view of this beautiful lake for 40 KM. The lake is quite beautiful and the bright blue colored water makes it even more charming. You should be here with the Best Kyrgyzstan Travel Packages. Picturesque landscape of snow-capped peaks of Pamir gets reflected in waters of the Karakul Lake and this is absolutely great view for the visitors. When you reach the lake you can feel much closer and is deep in color. Night is special time because you can enjoy bright light of Milky Way. Falconry is a sport of hunting with birds of prey like eagle. This sport has a long history. 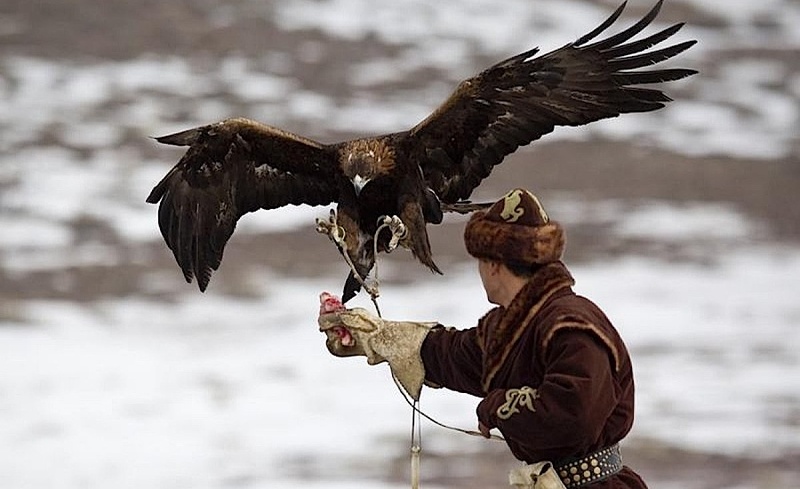 Hunting with golden eagles has been a tradition dating back thousands of years on the Eurasian steppe. Currently it is still practiced in U.S., U.K., Mongolia, Kazakhstan, and Kyrgyzstan and in China. Hunting with birds has been an art practiced in Kazakhstan for long. Hunters take a lethal bird of prey from its mother, nurse it until it has a wingspan larger than most humans, and then train it to attack fast-moving prey from the air and hand it over to them, their masters. Now tradition of Kazak people hunting with eagles for centuries is being revived as competitive sport in the country. This tradition of falconry is getting lot of attention lately. There is an eagle hunting museum in the small town of Nura, two hours east of Almaty. You can see the falcon show in Almaty and admire the most beautiful birds of prey, learn about their biological characteristics. In the falcon show you can see the trained birds demonstrating how to hunt with a bird, how the birds gather food from the water, and more. You can truly experience the tradition and history of falconry during the spectacular performance with the free-flying birds of prey. Karakol Ski Resort is the best ski resort in not just in Karakol town, Kyrgyzstan but entire Central Asia region. The Karakol Ski resort is the best place for skiing. 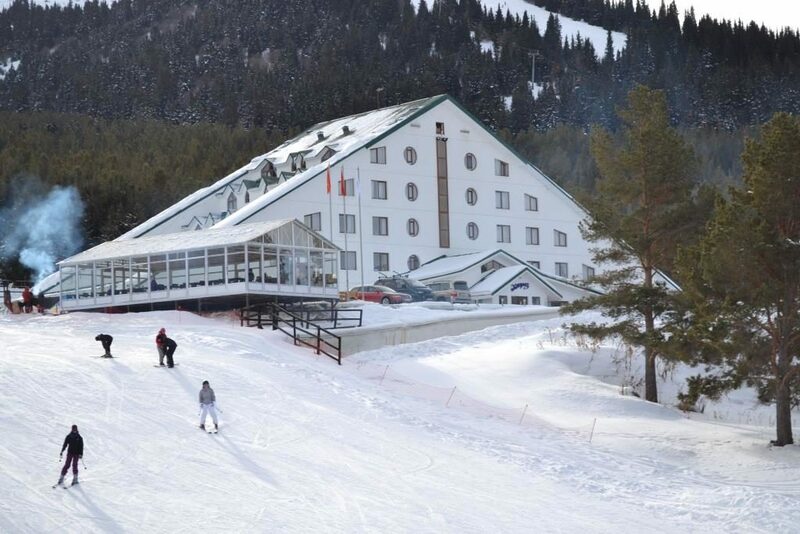 It is surrounded by pine forest and is an absolute delight for both beginners and experienced skiers. Those not interested in skiing can enjoy the the view around which is so spectacular over Issyk Kul Lake and the wider Tien Shan Range. Snow blanket above 1 m over the mountain is quite normal to be seen. On your skill base you can choose to go for easy, intermediate and difficult skiing. 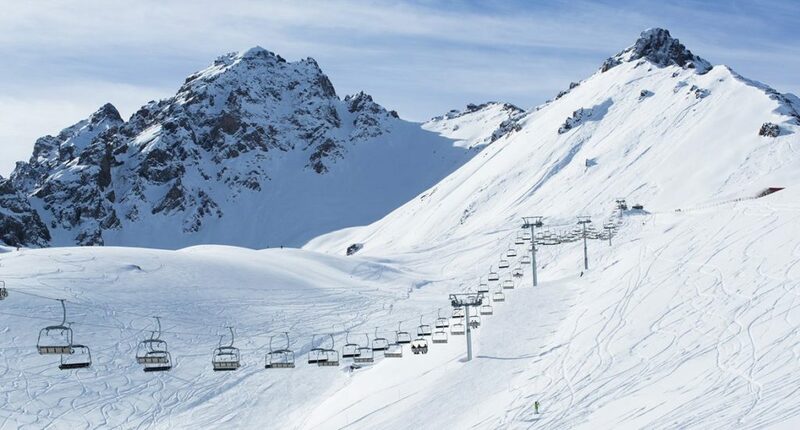 The weather changes frequently, so the opening times are provided by the Ski resort of Karakol and it may vary which is dependent on external conditions, day and time, school holidays and other public holidays. Equipment for skiing are available on rent on the site itself. Accommodation and food is available here however they are not in plenty. The pine forests and a mild climate combined together make this skiing place highly attractive for winter holidays. Temperature rarely foes below -5 degree here in winter season and snow cover goes up to 2.5 meters. In the summers also one can enjoy horse riding, hiking or take off road routes for adventure activities. Tashkent-Samarkand Bullet Train covers 344 KM connecting two largest cities of Uzbekistan. 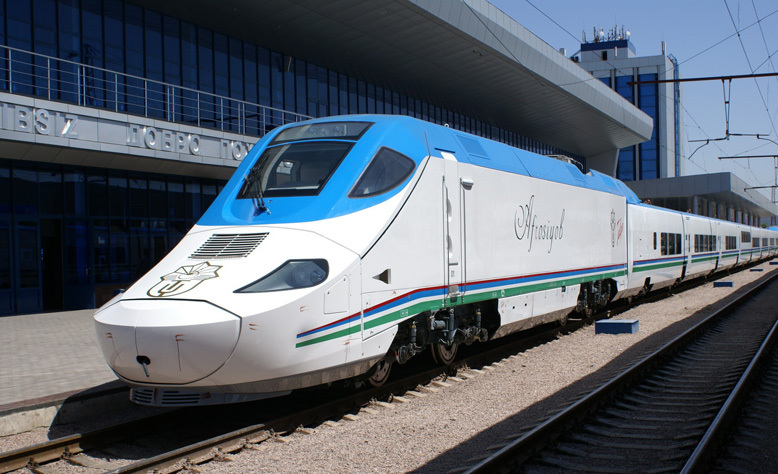 The train passes through Tashkent, Sirdaryo, Jizzakh and Samarkand. The Bullet train runs for all 7 days of a week under the brand name Afrosiyob. So one looking to travel from Tashkent to Samarkand or from Samarkand to Tashkent can buy tickets and board the bullet train for a 2.30 hours journey. Yes, the train runs at maximum speed of 250 KM/H and takes 2.30 hours to complete one way journey. You should also enjoy this high speed bullet train travel experience when you are in Uzbekistan on your Uzbekistan Trip. Charyn Canyon is Kazakhstan’s supreme rift. This canyon is cracked open and enlarged by a river with the same name. 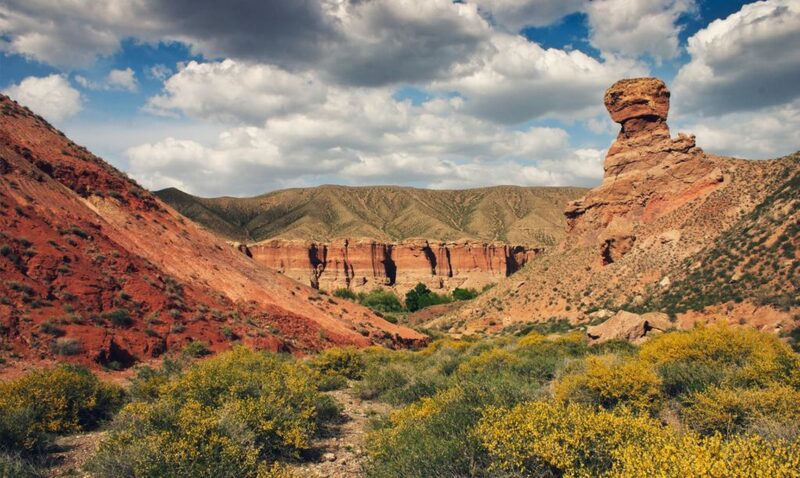 When you have visited the plains of Almaty in plenty then you will find Charyn Canyon as a grand surprise. The canyon has happened over millions of years and today you can find a fantastic shapes and shadows here. You can take a day trip to Charyn Canyon from Almaty and enjoy walking, rafting off-road jeep touring and simply immerse in beautiful nature. Simple 4 hours drive from Almaty Charyn Canyon is a must see place in Kazakhstan. Today the Canyon stretches up to approximately 150 km, and, in places up to 300 meters deep. The canyon features a dramatic landscape with beautiful red sand and formidable rock formations. This is a great place for rafting, hiking, climbing or nature appreciation. Turkmenistan has plenty of gas fields. Gates of hell is also part of one of those. This is in karakum desert in Turkmenistan. This is basically a natural gas field which is known as Door to hell or Gates to hell. This is a natural gas field in Derweze, Turkmenistan. This had collapsed into an underground cavern in 1971, which became a natural gas crater. At present this is not just a crater but also quite an attraction for tourists. 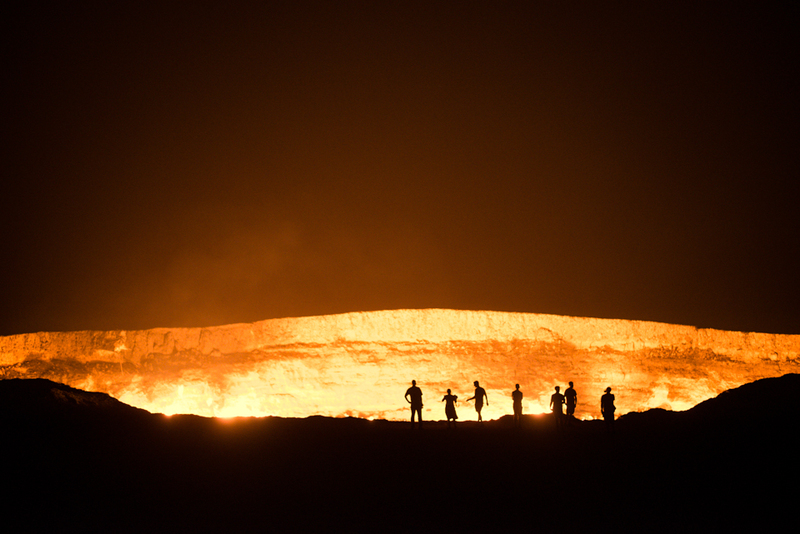 In the past five years more than 50,000 tourists have visited this Gate of hell. The gas crater has a total area of 5,350 m square, which is equal to the size of an American football field. The surrounding area is also popular for wild desert camping. Know more about the “Turkmenistan Tourism“! Pamir Highway is second highest highway in the world located in Tajikistan. This is also one of the most dangerous and adventurous route in the world. This highway is paved and unpaved both. Travelling on unpaved parts is more dangerous. In the past this highway has been used as one of the old silk routes for trades. Pamir highway runs from Khorog in Tajikistan to Osh in Kyrgyzstan. Landslides and rock fall incidents happen quite regularly here. Unpredictable weather on top makes it even more adventurous. Historically it was called Pamir Highway and now it is officially called M41. Most of the Pamir Highway is located in Tajikistan, but the highway also goes through Afghanistan, Uzbekistan and Kyrgyzstan in Central Asia. Most part of the highway is still unpaved and the road is heavily damaged in many places caused by erosion, earthquakes, landslides and avalanches. 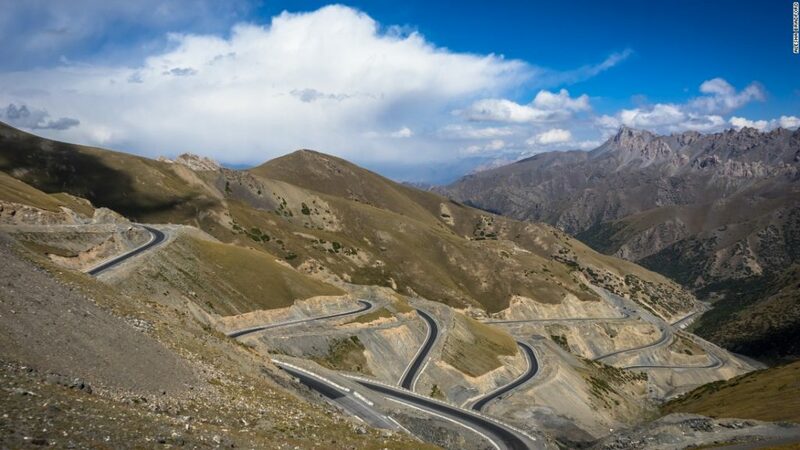 The Pamir highway leads from the city of Osh, Kyrgyzstan, through Tajikistan (Gorno-Badakhshan Autonomous Province, Khorug, Dushanbe), via the eastern part of Uzbekistan, to Mazar-e Sharif in northern Afghanistan. All the adventure lovers challenge themselves to walk the Pamir highway. Located just 30 min drive from Almaty, 8 Lakes Resort is a unique complex. You get largest pool complex, fine dining choices and many outdoor activities here. You love to have great time at resorts and 8 lakes resort offers you variety of recreational facilities. This simply means that the 8 lake resort is a perfect place to be for families on a holiday or people on a business trip. When you go to a trip you look for home away from home. 8 lakes resort is such a place where you get the comfort of home. You can enjoy your stay here when in Almaty with Almaty Tour Package for that perfect rejuvenation and relaxation that you are looking for. You can enjoy multiple recreational activities here which include swimming in the beach pool, snowmobiles, paddle boating and row boats, bicycle walk, playing billiards, football, basket ball, mini golf and so on. So you have everything on plate. Food is also a specialty of 8 lakes resort. You can enjoy multi cuisine and for those who love to drink have many bars as well. 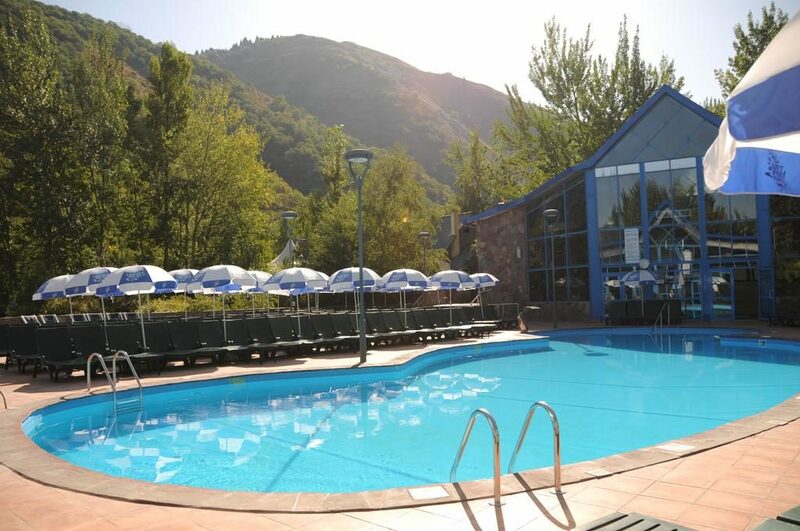 Just 15 minute drive from Almaty Tau Spa Resort is located at the foothills of Zailisky Alatau in natural boundaries of the magnificent gorge of Almarasan. In Tau Spa resort you get everything you expected. There are several pools in the fresh air with hills. There are indoor pools as well. 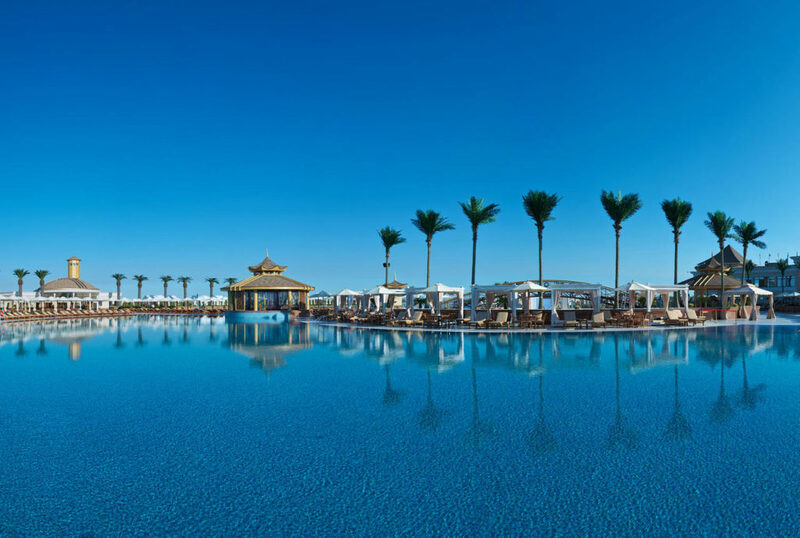 Both children and adults can enjoy the swimming in pools of the resort. You also have choices of entertainment and restaurants which offer Kazakh, Russian, European and Georgian meals. In the resort there is Tau Spa center along with many restaurants and clubs. You will for sure have a great time here. The prices of rooms are economical and features are excellent. Bath houses of medieval time are called Hammams in Central Asia. This form of architecture shows the town planning and development of the region. There were numbers of Hammams in Uzbekistan. Bukhara had 16, Tashkent had 11 by the middle of 19th century and Samarkand had 8 at the beginning of 20th century. Depending on the locations baths were divided into 2 types. One was located in the bazaar and another one was located in blocks. For better conveniences, many hammams were built at a crossroads of streets, closer to other public buildings. 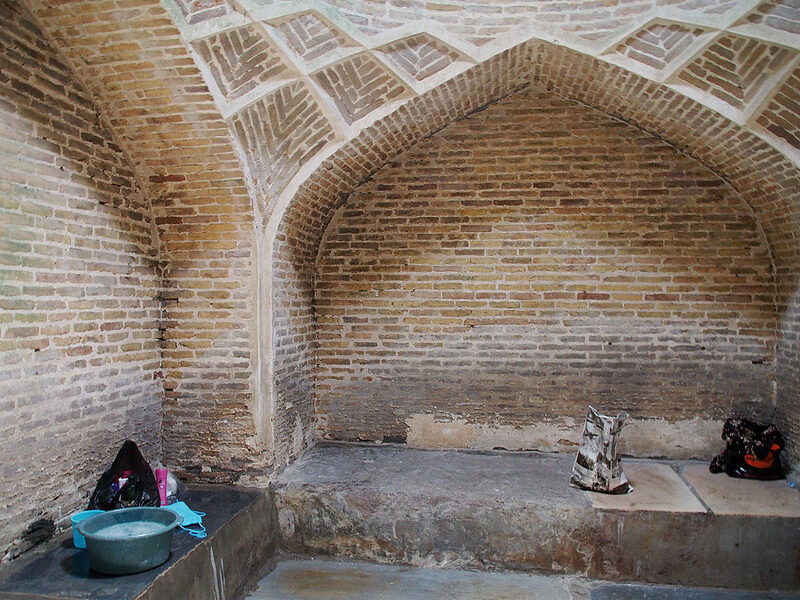 Such Hammams in Bukhara and Samarkand were called “Hammom Kundjak”, which means a “corner bath”. One of such baths is still functional near Kalyan Minaret in Bukhara. These Hammams represented civil architecture of Central Asia and many of these still functions successfully. In Bukhara particularly two Hammams Bozori Kord and Kundjak Hammam are still active and you can go there to experience the atmosphere of the medieval east. Know more “About Uzbekistan At a Glance“! Kizikulam Desert is the 16th largest desert in the world. The desert is located in doab region in Central Asia between Amu Darya and Syr Darya. The desert is divided between Uzbekistan, Kazakhtan and Turkmenistan. In the desert camel riding is a great tourist activity. Camel riding is a wonderful experience anyway. And in the Kizilkum desert in Uzbekistan, camel ride is an exotic outdoor activity. You will get to see bactrian camels (two-humped) in the Kyzyl-Kum Desert. You can ride these camels which are very interesting and informative. There are camel camps in the Kizilkum desert among the dunes. For rest, stay and sleep there are tents. 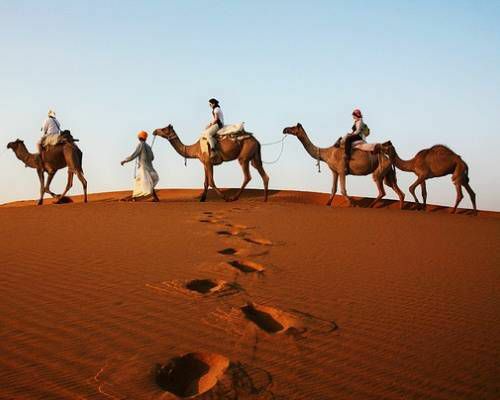 You can opt for camel riding for a single day or for days. Iskanderkul is a Mountain Lake in Tajikistan. The lake is 2.5 KM long and 1 KM wide with depth of 72 m at the deepest part of it. Iskanderkul is located at the height of 2,255 m above sea level. 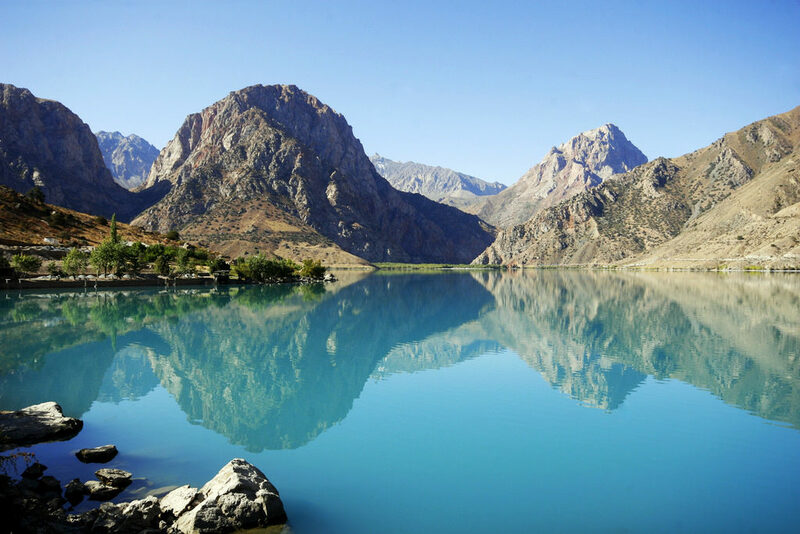 Not just locals of Tajikistan but people from all over the world now come to see Iskanderkul and you should also visit this beautiful lake with best Tajikistan Tour Package. Turquoise, calm and surrounded by giant ranges of Fann mountains Iskander is a popular tourist place far beyond Tajikistan borders. Fann Mountain around the lake creates the most spectacular and picturesque places. However because of high concentration of minerals there is almost no aquatic life in the lake and only small loach can be found in the waters of the lake. Chorsu Bazaar is in Tashkent, capital city of Uzbekistan. It is located in in the old town of Tashkent. Chorsu Bazaar is a traditional Bazaar which is hundreds years old. Chorsu Bazaar is quite colorful. This bazaar is the biggest and one of the oldest in Uzbekistan and in Central Asia. Located across the street from Chorsu Station of the Tashkent metro near Kukeldosh Madrasah, you will get all daily necessities available. Tashkent has been a trade center where from good came into and went out of Tashkent. So a fair was set up where goods came into and went out eastward, westward, southward and northward caravan routes. This was called as Chorsu which means crossroad. Since then this oriental bazar has lived through in Tashkent city. 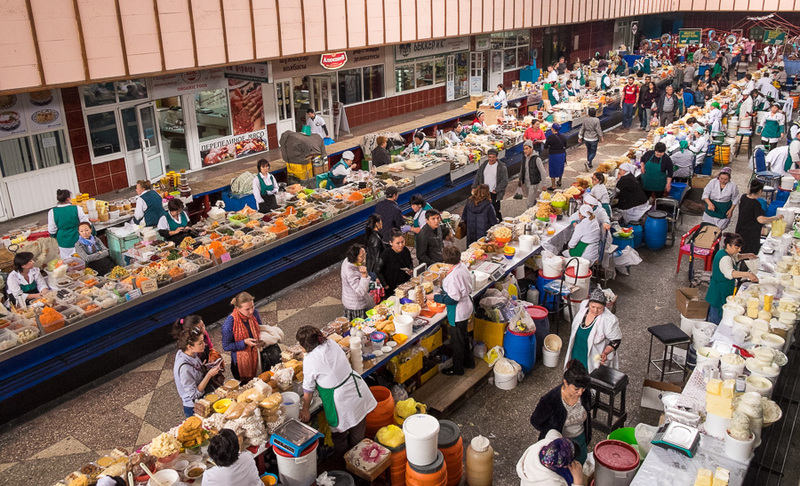 Market has always been alive and a place where people gathered, talked, shared their lives. So chorus bazaar is not just a market place to buy goods when you are in Tashkent with Tashkent Tour Package but it enjoys great flavor of the orient as well. Are you an old school type who loved to go to markets for shopping and not the newly built malls. If yes then in Almaty you can head towards Zelyony Bazaar located near Paniflov Park. This is also known as Green Market. This is a market where you can buy everything like clothes, furniture, spices, meats and fruits. And on top of that you can bargain hard here. 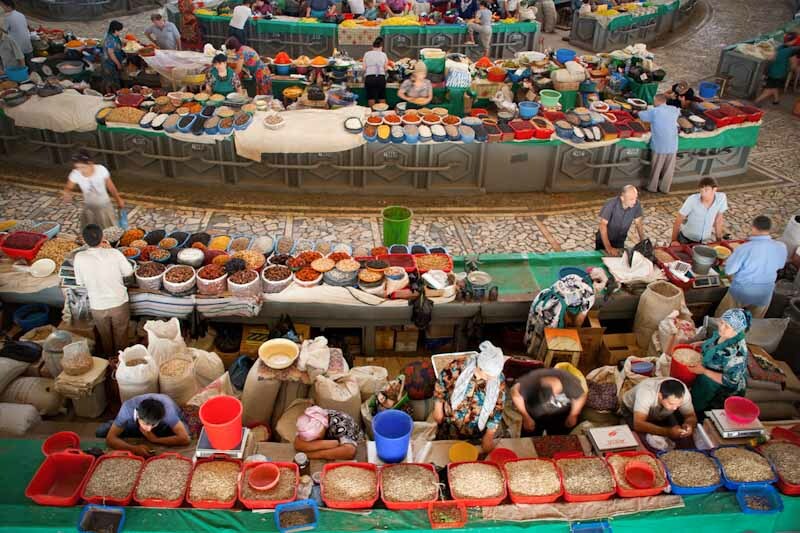 On your Almaty tour package you can visit the market. You will be delighted to see the atmosphere and variety of goods available in the market. For different items there are different sections and at each section you will be amazed to see variety of items being sold in the Zelyony Bazaar. Osh Bazaar is oldest Bazaar of Kyrgyzstan and one of the oldest in entire Central Asia. It is one of the largest Bazaars in Bishkek as well. You get everything in Osh Bazaar like food products, any household items, clothes, souvenirs, musical instruments or any other item. Osh Bazaar is one of the main attractions of Bishkek and must visit place while on a Bishkek trip with Bishkek Tour Package. In this chaotic Bazaar you can buy souvenirs, clothes and everything else under the sun. You can witness the local life and culture through this Bazaar where on top of it you can buy anything you wish to. 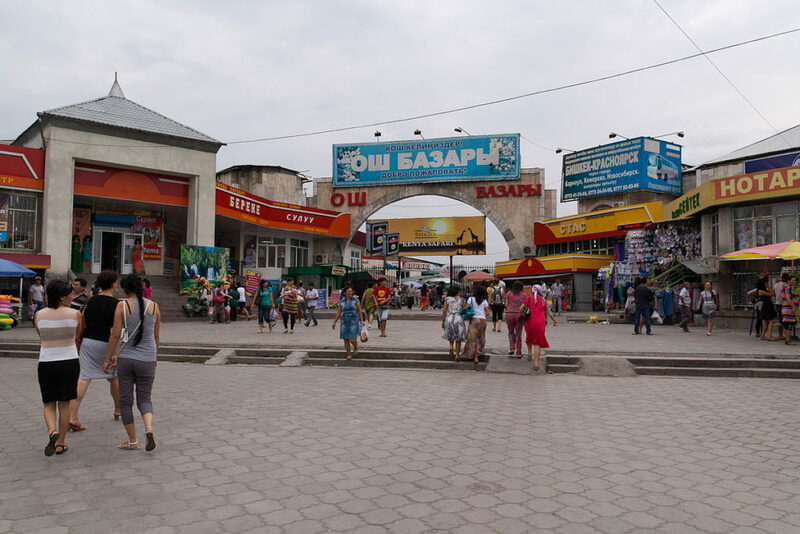 Osh Bazaar, the shopping center of Bishkek was a key stop on the ancient Silk Road through Central Asia. The smell of spices, the crowd leaving little space to move, haggling of smiling vendors and much more gives you a vibe of multicultural intensity of the Bazaar. 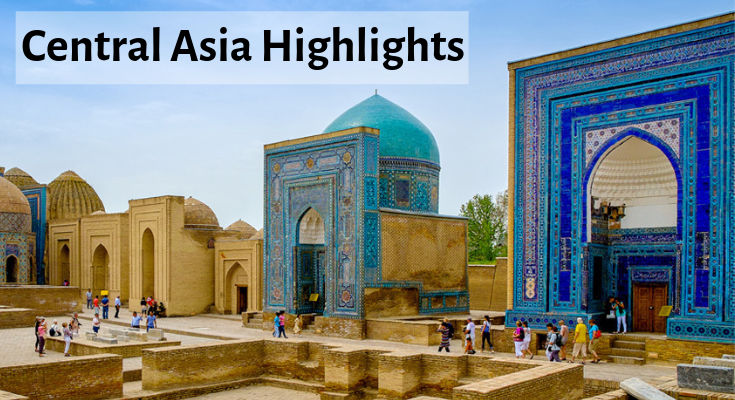 Central Asia Travel Guide & Highlights: So all above are the Major Central Asia Attractions which you can visit on your tour to Central Asia countries and cities. You can ask to your tour operator to add-on some of the above places in tour itinerary on your trip to Central Asia. 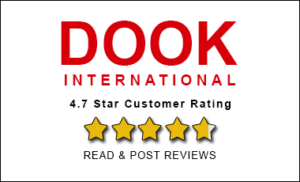 Here are some more articles published by Dook International which help you to know more about Central Asia like Tourist Destinations & Things to Do in Central Asia, Facts about Central Asia Tours, Central Asia Travel Information.